This Apple Olive Oil Boulé is a perfect bread for making epic Thanksgiving leftover turkey sandwiches, autumn french toast, or passing around the table! This Apple Olive Oil Boulé recipe is my second recipe I am contributing to the #BreadBakers collaborative. (The first was these epic Brown Butter & Pumpkin Seed Scones!) This group gets together a bunch of food bloggers to create a recipe around a common theme. This month’s host is Pavani from cookshideout.com, and her chosen theme is fall fruits & vegetables! Make sure to scroll past my recipe to see the other awesome contributions based on Pavani’s theme! If you want an amazing, high quality olive oil to use in this recipe, it’s not to late to enter to win a bottle of Esplendido Douro’s award winning Azeite Esplendido EVOO. Follow me here to enter, and to learn about how apples and olive oil complement each other! How To Buy & Store Apples. Everything you need to know about picking the right apple for the job. Plus, there is a FAQ section for everything you might want to know about apples. Understanding Yeast. This explains the basics of yeast, the different kinds, and how/why it works. Different Types Of Flour. I recommend bread flour for this Apple Olive Oil Boulé. Find out why, and how to substitute it if you want to use something different. How To Bake. A full explanation of the baking cooking method. If you have any leftovers of this Apple Olive Oil Boulé, it will stay fresh for 48 hours at room temperature. The trick to this is that you need to store it as airtight as possible. My favorite way to do this is to wrap it with plastic wrap (or Bees Wrap) then stick it in an airtight bag or container. In my experience, freshly baked bread rarely lasts long enough to go stale, but removing as much from surrounding it as possible will help prevent this. If for some reason you tuck your Apple Olive Oil Boulé into the corner and forget about, don’t worry! As long as you catch it within the first 4 days after baking (give or take, depending on how you stored it) you can recover it a little by warming it in the oven. Place your Apple Olive Oil Boulé on a sheet pan and place in the oven for 5 minutes or until lightly warmed throughout. If your loaf is large enough, you can stick it directly on the oven rack and save yourself a dish to wash later. Just a heads up, you can only warm/reheat/de-stale-ify your Apple Olive Oil Boulé once (maybe twice). The extra heat exposure from the warming removes moisture. While this isn’t a problem while the bread is still warm, once it cools and settles, it will become slightly more stale then it was before you reheated it. If you’re wondering what kind of delicious things you can do with this Apple Olive Oil Boulé, the first thing I always recommend is SANDWICHES!!! This bread is seriously SO GOOD on a fresh sandwich, grilled cheese, or panini. The apples lend it a sweetness that accents nicely, while the olive oil flavor keeps the bread moist and savory. It’s such a good bread for Thanksgiving leftover turkey sandwiches! If you want to branch beyond that, it works great for french toast! TIP: DO NOT use glass or ceramic in your oven for holding your ice. Trust the girl who totally spaced this and shattered her 9×13″ Pyrex. (Points at herself…) Stick with stainless steel to prevent shrieking like a little school girl when the glass breaks. Get your free printable grocery list for this Apple Olive Oil Boulé Recipe HERE. This grocery list has everything you’ll need to make this tasty bread. Each ingredient is listed in easy to find amounts that will help make grocery shopping as simple as possible. If no specific amount is listed that means you can purchase the smallest package available and still have leftovers. I want to say a super huge thank you to Pavani from cookshideout.com for hosting this month’s #BreadBakers collection. #BreadBakers is a group of bread loving bakers who get together once a month to bake bread with a common ingredient or theme. Follow our Pinterest board right here. 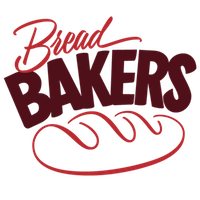 Updated links are also available on this #BreadBakers home page. We take turns hosting each month and choosing the theme/ingredient. If you are a food blogger and would like to join us, just send Stacy an email with your blog URL to foodlustpeoplelove@gmail.com. For this month’s theme, any and all in-season autumn fruits and vegetables are fair game, including: apples, grapes, pears, sweet potatoes, cauliflower, broccoli, acorn squash, butternut squash etc… Here’s the list of all the recipes and the lovely bloggers who participated in this month’s theme of fall fruits & vegetables! This delicious Apple Olive Oil Bread makes a delicious bread for panini, grilled cheese, autumn french toast, and perfect Thanksgiving leftover turkey sandwiches! In a bowl or 2 cup liquid measuring cup, combine the warm water, yeast, and honey. Let sit for 5 Minutes or until the yeast has proofed and becomes frothy. In the bowl of an electric mixer fitted with the dough hook, combine the bread flour, salt, and olive oil. Turn the mixer on medium low and slowly incorporate the yeast mixture. Continue to knead until the dough is a combined ball, about 3 Minutes. If your dough is too dry, add some water a teaspoon at a time until the dough comes together. Turn the dough out onto a lightly floured surface and begin kneading in the apples until they are all completely incorporated. Brush the bowl and the dough lightly with olive oil, cover the bowl with a slightly damp towel and set in a warm place to rise for 1 Hour, or until doubled in size. Turn the dough out onto a lightly floured surface and shape into a ball, using the sides of your hands to tuck the dough tightly under while rotating the ball to make the dough tight. Transfer to a baking sheet and let rise 10 Minutes. Put the bread on the middle rack of the oven and quickly add the ice to the stainless steel container on the bottom shelf. Close the door quickly and cook for 35 Minutes. Remove from the oven, let cool and serve. The longer you let the bread rise on it's final rise the more space you will have between your pieces of apple and the rest of the bread. Keep that time to a minimum to prevent your apples from falling out when the bread is sliced. This is a perfect Boulé Mackenzie! I just love the big chunks of apple and using it for a turkey sandwich sounds just amazing. I love how you share techniques for success too! You’re so sweet, Julie. Thank you! Yikes!! Good tip on using stainless steel instead of glass. I don’t think the rapid change in temperature being a bad idea would have occurred to me. I think I’m still cleaning glass out of the oven, Kelster. lol. The second it happened all I could think was “I knew better”, but I feel like even the most seasoned baker could forget that one! Such an amazing loaf you got there!! I loved how you made the boule with olive oil. You’ve made a beautiful loaf of bread and I love the apples throughout the dough. Great tips for eating day old bread but I think this would disappear quickly at my house- no leftovers! Beautiful boule, Mackenzie! I love apples in bread and bet this would make a killer grilled cheese sandwich. SUCH GOOD GRILLED CHEESE!!! Our favorite was with a little Muenster, Havarti, and Jarlsberg. When we were feeling super fun we added some caramelized onions, fig jam and arugula. Such a gorgeous boule. I love the apples scattered in this loaf. That is a beautiful loaf of bread. Never thought of using apples in a yeast bread. Oh my goodness, this looks SO much like the bread that used to be sold at a bakery here in my town, which for some crazy, unknown reason, they stopped making! We’ve been missing it! I absolutely can’t wait to make this beautiful boule. It’s so perfect for an autumnal grilled cheese. Thank you, thank you! RIP Pyrex dish! This looks yummy. Just the thought of the apple taste mixing with turkey… Wow.